You are what you eat, read, watch, drink, hear, hang out with and think about. People tend to think that it's "magic" or the person is "gifted" or "lucky". Magic is something that we don't understand, cause effect relationships we can't see with our naked eye and untrained mind. Everything you see is the result of cause/effect relationships that have occurred somewhere upstream in the evolutionary river that flows with time. If you want to be successful in life and business -- you need to get good at tracing the cause/effect relationships upstream. You need to see the method behind the magic. In today's video, I discuss how this universal principle has helped me succeed in my own business and life. 1. Why people believe that success is some form of "magic" or luck that's unattainable to the everyday person. 2. Why people make the mistake of fixating on outputs and goals instead of the inputs and actions that cause those goals. 4. Why your financial success will be the direct result of the work you do day-to-day, hour-to-hour, minute-to-minute and how to make sure you're working on the right things using my War Map Calendar. 5. Why your energy, focus and ability to endure challenging tasks will be the direct result of your sleep, exercise and diet and how to make sure that you get the highest performance out of yourself. 6. Why your intelligence and ability to solve problems will be the direct result of the information you feed your brain and how to make sure you're feeding it the best info with books and documentaries. 7. Why everything you come into contact with from food, drink, social media, friends, family and tv shows directly shape who you are as a person. 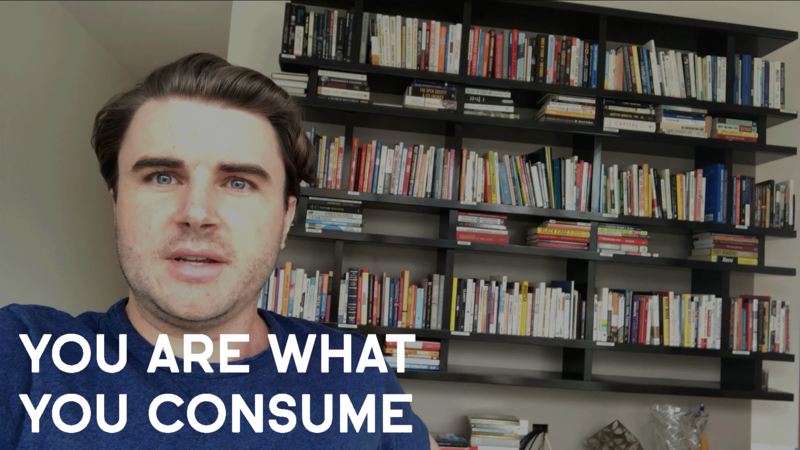 You are what you consume. I also share my War Map Calendar with you so that you can download it and use it for free to map out your own life and achieve your goals. To download my War Map Calendar and learn how to use it -- Click this link here. Hey everyone, it's Sam Ovens here and today I wanted to make a quick video to really give you a powerful tip to live by every day. There's one principle that's really helped me a lot in life and in business, and that is outputs derive from inputs. Outputs derive from inputs, what does that mean? Well, as Isaac Newton said, "For every action there is an equal and opposite reaction." Alright? And that really changed the whole way that the world viewed reality and how the universe worked and everything. They understood that for every action there is an equal and opposite reaction. To make something move there's has to be energy applied to it, so if you wanna make something move it can't just move magically. There has to be energy exerted in there to get it to move and the energy that goes into it is proportionate to how much it moves. That really helped the human race really excel at a lot of things and build machines and technology and things like that, but it goes a lot deeper than that. It's not just in physics, where we're looking at energy and moving stuff and things like that, it's also in your life and in your business. For every action there's an equal and opposite reaction, but for every output you've gotta look at what inputs go in. A lot of people, they forget about the inputs and they just obsess and they fixate on the output and I'll give you a specific example. A lot of people, they might look at people who are in good shape and fit and healthy and all of that, and then they might think, "Oh, well that person's just got good genetics." Or, "Oh that person's just lucky. ", or, "Oh that person was just born like that." That's not how it works. The people who are in good shape like that, they will be eating well, they will be sleeping well and they will be exercising. So those are the inputs to be healthy. So if you wanna be healthy it's not magic, it's just good eating, good sleeping, good exercise and it's as simple as that. Then when it comes to business, a lot of people think, "Oh that guy, he just got the money from his parents." Or, "Oh that guy were just lucky." Or, "Oh, that guy just fluked it." Or, "that business just was the perfect timing," or something like that. But that's not true either. I don't know any single person on earth that is wealthy and has the successful business that hasn't put in an insane amount of effort and hard work. If you want to make a lot of money, then there has to be an input and a huge amount of effort. For every action there's an equal and opposite reaction. So if you wanna be really successful, you've gotta put in a huge amount of work and there is really no magic to it. There's no instance where someone puts in no effort and gets out a huge amount of reward. This thing, it exists everywhere. It's one of these universal principles that you can use to guide you in life and everything and it really runs deep. Recently I was watching a TV series called Chef's Table and they interviewed the most successful chefs around the world and they asked them, "What's the secret to being one of the best chefs ever?" And I was like, "Oh, maybe these guys have some sort of magic." I've even started thinking like this. And then all of them were like, "The secret to really good food is really good ingredients." So we pretty much spend our entire lives just hunting for the best ingredients. And some of the best chefs in the world take this to the extreme of starting their own farms, so that they can ensure that they get the best ingredients. And then when they go to the farms, they have to make sure they've got the best soil. And then they've gotta make sure they've got the best grain, and all of this stuff. So it keeps going back. How do you have the best farm? Well you've gotta have the best soil. How do you have the best soil? Well you've gotta have the best next thing. And you've gotta keep tracing these cause-effect relationships upstream. You've gotta really go upstream and find out the different components that lead to the later components. And if you really get good at seeing things this way, and tracing things upstream, and figuring out what are the causes for this, what are the causes for this, then you can really start to pick apart anything. And you can really understand what it takes to build these things that seem impressive. So when it comes to having a successful business and all of that, I wanna give you a few tips to focus on that have powerful inputs that generate powerful outputs. Now the first one is what you spend your time doing day to day when you're working. So here on my screen, I've got my [inaudible 00:04:55] calendar. Now, my [inaudible 00:05:00] calendar is basically a calendar I use to map out my year, and then my quarter, and then my month, and then my weeks, and then my days. And I'm constantly, every day, multiple times per day, looking at this [inaudible 00:05:11] and mapping everything out. I wanna make sure that every day I'm at work, I'm implementing the most powerful things possible. I don't wanna get lost on social media, I don't wanna get lost on YouTube. Most people they think they're working, but really they're just sitting at a desk and they're not working. So the [inaudible 00:05:30] calendar is one of my tricks to make sure that the inputs going into my business are powerful, and I'm focusing on the right thing. So I'm gonna link beneath this video to the [inaudible 00:05:40] calendar so you can go check it out and use it for yourself. And another input, which is very powerful is food. So what food you have going into you. Because if you're low on energy, then chances are that you're not eating properly, and that's why ... In order for your body to exert energy, its gotta have good fuel in it. If you fill a car up with water, it's not gonna start. So you wanna make sure you got good food. So one thing I focused on this year and last year was having a chef and really making sure that we've got good food and all of that. And also not drinking fizzy drink, and sodas, and stuff like that. So you wanna make sure that you have good food going in, and you wanna make sure that you're planning out your day, and your month, and putting time into the right things. Now I'm gonna give you some more. So now we're gonna talk about inputs into your brain. So here you can see one of my book shelves, another one here, I think we've got about 1,000 books in here now. So another one you wanna look at is your brain. So what inputs are going into your brain in terms of information? Because if you wanna know why someone is smart, or why someone knows how to do something that you don't, they weren't born with it, and they weren't gifted or anything like that, those are all myths. The reason why is because they've just got good ingredients. Just like the chefs, they're not just magically the best chefs in the world, they focus on getting the best ingredients. So people who are smart, and people who know how to do things that you don't, and people who seem to always have the answers to things, really they don't. And really, they've just filled their heads with good information. Instead of watching Game Of Thrones, instead of watching the news, and instead of being on social media and looking at all of that crap, successful people are filling their brains with good inputs. And really good inputs are books. There really is nothing more powerful than reading good books. And that's why there's a quote that says, "Readers are leaders." And you know, it's very true. So I highly recommend filling your head with good information. And also, instead of watching movies, I recommend watching documentaries. Watch documentaries on the revolutionary leaders, watch documentaries about history and how the world came to be the way it is, because then you're filling your head with useful information that you can later use. You always wanna be thinking what inputs are going in, because the inputs that are going in, are gonna create the outputs that come out. So instead of focusing on how can I be rich? Or how can I buy a new car? Or how can I make $100,00? Focus on how can I get good sleep? How can I eat well? How can I do some exercise? And how can I read good books, and then how can I be productive and put in good work each day? Because if you focus on the inputs, the outputs just happen. But if you focus on the outputs, then nothing happens. And there's a saying that's, "Garbage in, garbage out." It's a popular saying in the development world, in the coding software world. And what it basically means is, it doesn't matter how good the system is, if you put garbage into a system, garbage is gonna come out of the system. So it doesn't matter how talented you are, it doesn't matter how gifted you are, or anything like that. If you put bad inputs into you, bad outputs are gonna come out. And this happens everywhere from how you spend your time each day, what books you read, what movies you watch, and how you spend your time, what food you put into you, and really who you hang out with too. Your friends and the people around you, they're inputs too. They're influences on you, and how you're gonna evolve. So you wanna be very careful about all of these things that you come into contact with. You wanna be careful with the information you read, the movies you watch, the music you listen to, the people you are around, how you spend your time. Because all of these things massively influence who you are. You are pretty much what you consume. So if you're constantly hanging out with people that are talking about negative, useless stuff, and if you're constantly watching negative movies, and Netflix and stuff, you know what's gonna come out, garbage, nothing. Nothing special. So really, if you want to do well in life, and if you want to do well in business and everything, always think for every action there's an equal and opposite reaction. And garbage in, garbage out. So you wanna constantly be thinking, "How can I make sure that I'm focusing on the right inputs to generate the outputs?" And when you do that, everything will change and shift for you. So that's it for this video, I just wanted to do a quick one today, and I wanted to just give you a quick tip that I'm sure will help you throughout business and life. Thanks.